Asian markets mostly saw moderate gains yesterday, as the latest positive turn in the Trump-Xi dalliance gave stocks a mild mid-week boost. Singapore stocks ended higher with the Straits Times Index rising 4.08 points, or 0.1 per cent to 3,094.48. Gainers outnumbered losers 225 to 146, after about 2.17 billion shares worth $1.03 billion changed hands. Elsewhere in Asia, Hong Kong and China closed higher by more than a per cent each. Japan's Nikkei 225 climbed 1.02 per cent, while South Korea's Kospi gained 0.42 per cent. But, Australia was down marginally. Overnight, top White House economic adviser Larry Kudlow said US President Donald Trump thinks there is "a good possibility that we can make a deal". Mr Kudlow had added that he sees it as an "opportunity to extend the optimism". On Monday, Mr Trump had issued fresh threats of increased tariffs on Chinese goods if the US and China cannot reach a deal after G-20 talks in Argentina this weekend. 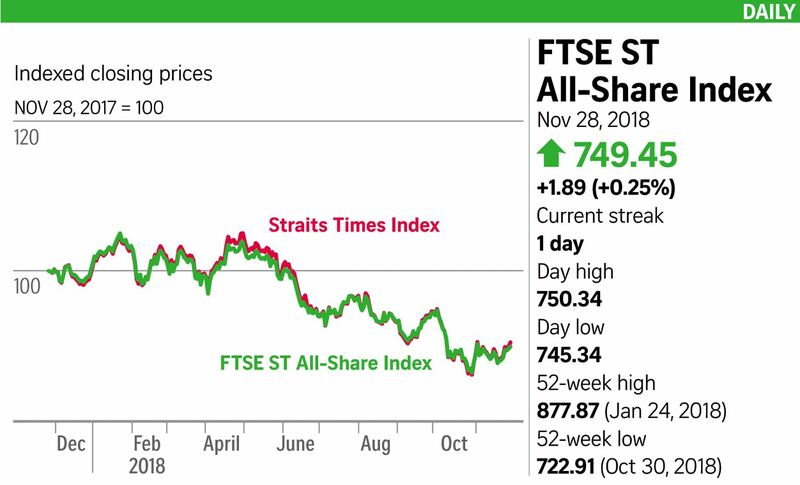 Mr Eli Lee, head of investment strategy at the Bank of Singapore, said in a report that given the markets are pricing in some likelihood of a ceasefire or resolution, a no-deal scenario will cause a negative knee-jerk reaction for risk assets. Investors were also looking to US Federal Reserve chair Jerome Powell's speech last night for directions on the Fed's hike path. On Tuesday, Fed vice-chairman Richard Clarida had backed further gradual rate increases and called risks "less skewed to the downside". The Fed is expected to raise rates next month, but the key is whether it will pause hikes next year, in the face of trade uncertainty and softening growth prospects. Adding to investors' radar are the US' third-quarter GDP reading and new home sales - viewed as important indicators of the US' macro health - last night. On the local front, KGI Securities suggested investors stay engaged in Singapore and Hong Kong stocks ahead of the G-20 meeting: "Singapore stocks are already cheap, so downside risks are limited." They pointed to how last month's fund outflows have caused many Singapore blue-chip stocks to drop below key technical support levels. Singtel was the biggest loser among index stocks, and one of the most actively traded by volume yesterday. It lost 1.29 per cent to $3.07 on trade of 38.5 million shares. Shares of Singapore tech manufacturers lifted higher: Valuetronics was up 0.75 per cent; Venture added 0.2 per cent and AEM Holdings put on 1.03 per cent.